Academic talks politics with AI - A roundtable discussion with George, an advanced computer program that can chat with humans. The discussion will be part of a workshop on Theorising the International after the Subject: Towards a Post-Human International Politics? keipdœnkur atla bollasonar - Space is infinite. October 2006 William's Class Blog 2006 - Artificial Intelligence - an oxymoron??? 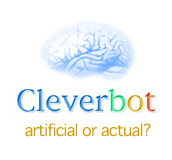 Slashdot - George the Next Generation AI? Where have all the funny people got to?